To celebrate Record Store Day 2018, we are extremely proud to bring you the exclusive new limited-edition turntable with long-term partners Rega Research. The new design is available to pre-order right now and will be available to collect from the shop on Record Store Day on the 21st April 2018. UK delivery only if still available after RSD. Built around the stunning high gloss acrylic skin plinth from the award winning Rega Planar 2, this year’s turntable delivers a serious punch. Featuring a high performance low noise 24v high spec motor driving a precision main bearing and unique white platter, topped with a Rega / Record Store Day themed mat. You will also find the award-winning hand-built RB110 tonearm (factory fitted with a Rega Carbon cartridge) designed to deliver exceptional performance whilst remaining one of the simplest turntables to set-up on the market. All of these quality engineered components are designed to extract as much information from the vinyl surface as possible and guarantee to give your record collection a new lease of life. 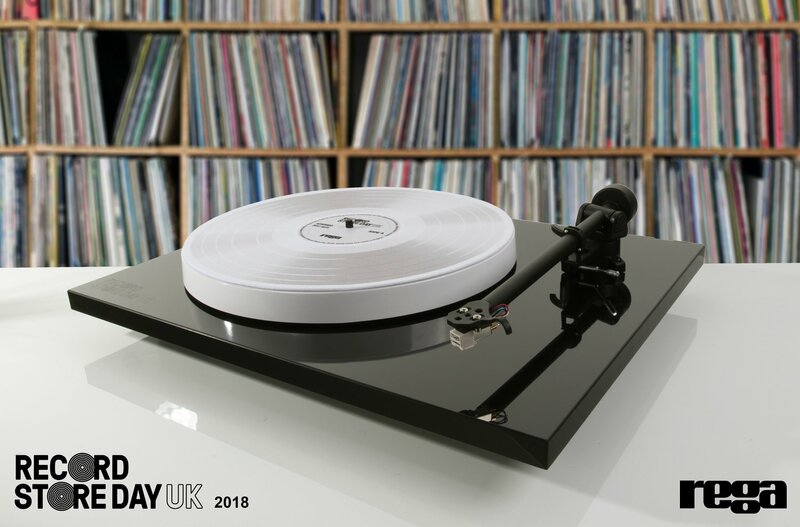 Simon Webster of Rega Research said “This years limited edition Record Store Day turntable is a unique hybrid of two of Rega’s most popular multi-award winning Planar turntables.